The image soars high above the ground — a young man frozen in a joyful, belly-first leap, arms thrown back, a thick rainbow of birds exploding from the soles of his dark sneakers. For artist-scholar Fahamu Pecou, the public art installation that has taken shape this month on a 70-foot wide and 40-foot tall exterior wall of the King Memorial Metropolitan Atlanta Rapid Transit Authority (MARTA) station on Decatur Street in southeast Atlanta easily represents his largest canvas yet. 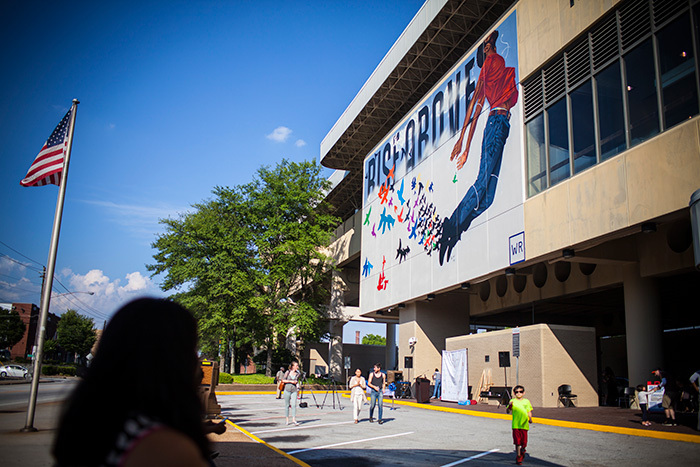 Formally unveiled at a community celebration on June 29, the King Memorial mural is the first in a series of large-scale art installations that he’s been chosen to create at four MARTA stations. 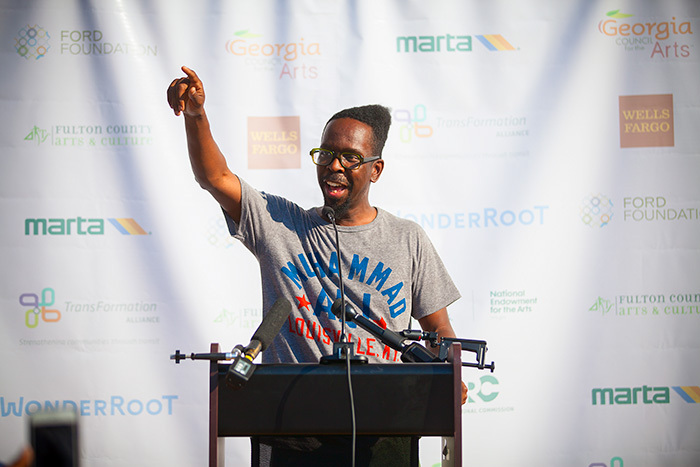 The public art projects are coordinated through WonderRoot, an Atlanta-based non-profit arts and service organization that unites artists and communities to inspire social change. Funded through a $50,000 grant from the National Endowment for the Arts’ “Our Town” program, the project is a collaboration between MARTA, WonderRoot, Fulton County Arts and Culture and The Transformation Alliance, with additional support from the Georgia Council for the Arts. For Pecou, who is in his fourth year of PhD studies in Emory’s Graduate Institute for the Liberal Arts and Laney Graduate School, the project offers an opportunity to explore true public scholarship, creating art that engages area residents, stimulating both thought and dialogue. “I’ve always described this project as art installations that present teachable moments, works that are aligned with not just elevating the conversation and narrative around the cultural, social and political climate of the city, but engaging with it,” says Pecou. Though his work has been exhibited in galleries around the world, Pecou knows this project may well generate his largest audience to date. “As much as I’m interested in wanting to explore public scholarship, this is my first time doing something this public,” he chuckles. “While my work in galleries and museums is technically public, this is out there whether you want to see it or not. Over the past decade, Pecou has made a name for himself as an up-and-coming visual artist who blends his observations on hip-hop, fine art and popular culture, with a particular focus on contemporary representation of black masculinity — a focus of his studies at Emory. His work is featured in national and international collections including the new Smithsonian National Museum of African American Art and Culture, due to open in September on the National Mall in Washington, D.C., Atlanta's High Museum of Art, and Societe Generale in Paris, among others. 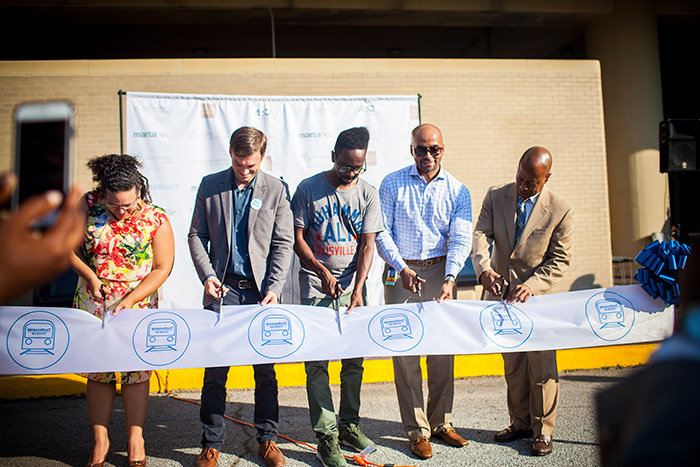 But when he was selected as the lead artist on the MARTA “En Route” project, he seized the challenge of not only enlivening public spaces but also creating something that engaged with the community and tapped into social issues. For the initial installation, Pecou had conversations with area residents and community leaders to help inform the final design. Given that it would be based on MARTA’s King Memorial station, he knew there was an expectation that the work would somehow depict the famed civil rights leader. “Many anticipated this would be a portrait of Dr. Martin Luther King Jr., but I resisted that,” Pecou says. “While I truly believe that Dr. King was a very important figure in our cultural landscape, larger than the man is the message he represented and how today we have to act on his message, recognize our own agency. “I thought it was really powerful," Pecou explains, "allowing us to be engaged and activated by the message as opposed to thinking that we have to wait for someone to do these things instead of doing them ourselves." 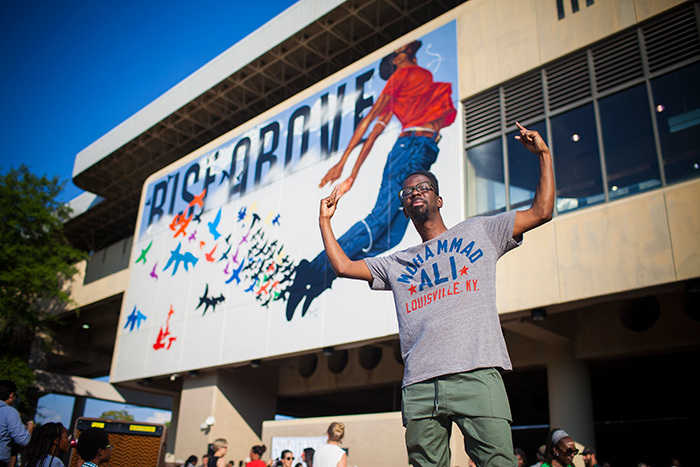 Work on the large-scale installation began on June 4 and was completed in five days, with Pecou serving as lead artist with assistance from Atlanta area artists Fabian Williams and Joe Dreher. They began the process by inviting people from the community to attend a photo shoot to capture “the perfect jump.” Once they had a model, a digital mock-up of the image was superimposed over a photograph of the building to determine scale. The station’s façade offered a natural grid pattern, “so, for example, we could determine that the bend in his knee happens halfway up a certain block in the wall — we really had to eyeball it,” Pecou says. A rough outline was sketched on the building using aerosol spray paint, which provided a base for the final image. Working with a wall 20 feet off the ground — at its tallest, the mural is 65 feet high — the artists painted from an aerial lift that could raise them as high as 80 feet in the air. Pecou enjoyed seeing public interest in the project grow as the image took shape. The next “En Route” installation will be created at the Oakland City MARTA station, with work scheduled for mid-September through early October . Next up for Pecou is what he believes may be his biggest, most ambitious exhibition ever: “Do or Die: Affect, Ritual, Resistance,” a solo exhibit that runs Aug. 26 through Oct. 8 at the Halsey Institute of Contemporary Art at the College of Charleston School of the Arts in Charleston, South Carolina. On Saturday, Aug. 27, Pecou will be at the gallery for a walk-through and lecture that is free and open to the public. Given that Pecou spent much of his childhood in South Carolina and that the exhibit will be presented near the Emanuel African Methodist Episcopal Church, where nine African-American parishioners were shot last summer in what authorities have called racist killings, the venue is especially meaningful. With themes “definitely conversant with the Black Lives Matter movement,” the exhibit also represents “a culmination of a lot of my work and research at Emory and complements my dissertation,” he explains.